Very few music artists operate like The Music Doctor. Cornelius MD brings to the stage an intoxicating, romantic and captivating voice that closely resembles “The Maestro” himself Barry White with an injection of Isaac Hayes. In recent years, Cornelius MD has opened for legendary acts such as Dionne Warwick, Ray, Goodman and Brown, and the Chi-lites to name a few. Cornelius MD’s music was recently presented to one of R&B’s most legendary managers, Mr. Joe Douglas who represents the world-reknown group Frankie Beverly and Maze. 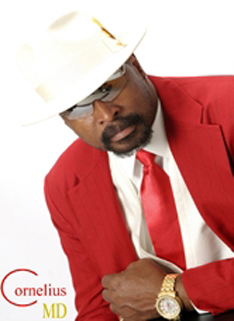 Given the nod, on June 28, 2011 Cornelius MD signed on with Joe Douglas Management. The Music Doctor is working on his own prescription for love, his latest single “I Belong to You” a remake of a song written, arranged, and produced by the late, great, Barry White. His new album, “The Best of Cornelius MD” was released in January, 2012.